Removing an unneeded fourth bedroom to allow adjacent rooms to expand. 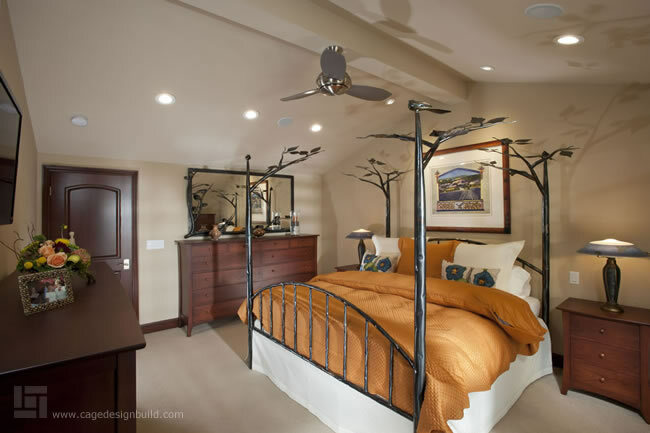 Vaulting the ceiling in the master bedroom for heightened, dramatic effect. Completely reconfiguring the master bathroom to give it a spa-like feel. Adding dueling shower heads in the master bathroom. Installing the Savant Home Automation Control, which can be controlled remotely with an Apple mobile device. Creating a granite-topped center island in the master closet. Connecting the master closet and laundry room to easily move clothes back and forth. 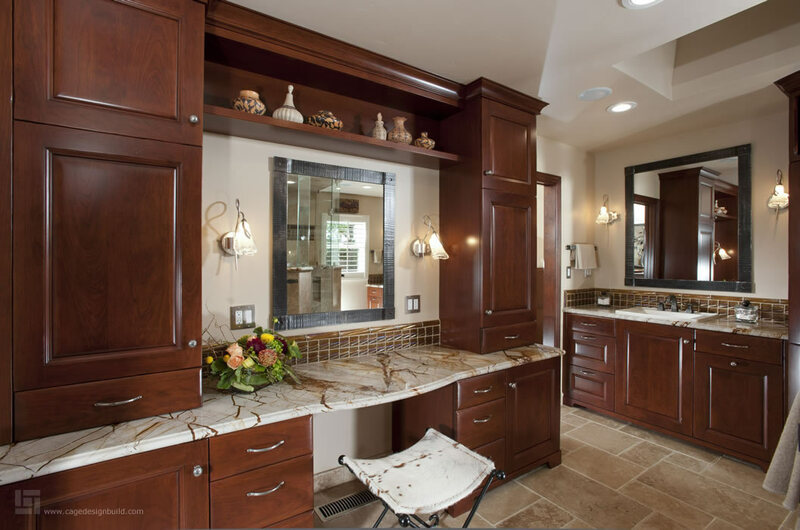 The Saratoga remodeling project involved numerous creative design details. Click on an area of the remodel below to view its featured design elements. Creating a separate walk-in toilet area for privacy. Installing a new clear glass, frameless shower surround. Adding luxurious dueling shower heads, which spray from both sides. Installing a TV into the space. Adding beautiful radius cabinets with rounded doors, and also creating a radius design for the vanity to play up on the circular feel of the space. 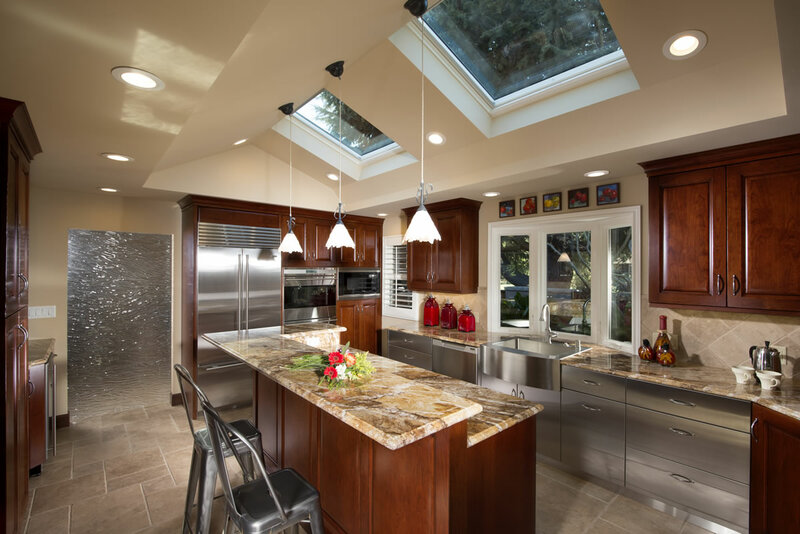 Adding two new Velux skylights with comfort glass plus electronic blackout shades to give height and interest, as well as increase natural light. Installing two six-inch round recessed incandescent light fixtures with enclosed trims. Adding a new Marvin Clad ultimate double hung window in a new opening. Putting in three-inch high crown molding for decorative effect. Vaulting the ceiling to provide dramatic height, and adding modern, energy efficient LED lighting. Installing beautiful Ashley Norton handles on the lovely interior doors. Using low or no VOC paint for environmental purposes. Expanding the wall of the kitchen nook to gain more space. Giving the kitchen a more rustic contemporary look by using a combination of cherry wood and stainless. Incorporating seating into the island for everyday eating. Installing two skylights with a recessed ceiling detail to allow for more light as well as giving the sense of a higher ceiling. Vaulting the ceiling to give maximum storage space. Creating a gorgeous granite-topped center island. Installing additional storage features with Cottonwood cabinetry. Creating custom-sized shelving to store purses and shoes, and installing glass doors to hang the homeowners gowns behind. Adding a pass-through door to the laundry room, which conveniently allowed clothes to be passed between the closet and laundry. Installing a solar tube into the ceiling to allow for maximum natural light. 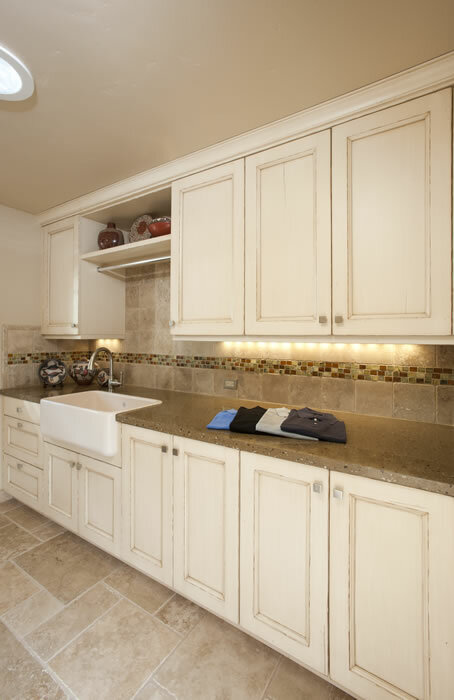 Installing deep 30-inch concrete countertops with colorful glass inlays, which allowed for plenty of room to fold laundry or wrap presents. Coordinating the countertop’s glass inlays to match the tile design in the room. Designing the countertops to accommodate a flush-mount farm sink. Adding energy efficient LED lighting both under the counter and in the ceiling. Using beautiful Cottonwood cabinets for storage. Installing retractable laundry room doors. Installing stone floors throughout for a sleek, modern look that’s easy to clean. In the garage, adding a new 75 gallon water heater with new pump, timer and expansion tank in a closet. In the attic, installing two Trane XV95 two-stage variable speed furnaces as well as two Trane clean effects air cleaners.